If climate scientists are correct, this declaration may be useful in the future. Billions of people, living in cities currently at or near sea level, and hundreds of millions, living in areas experiencing desertification, such as in the sub-Sahara, will need to move. And the world will have to accommodate them in an orderly fashion. However, the UN declaration comes too late for the current refugee crisis: over 65 million people, the largest number in recorded history, currently displaced and/or refugees outside of their home countries. 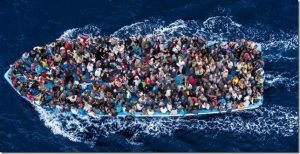 And this tidal wave of refugees sweeping over Europe is due, not to climate change but to international lawlessness, specifically to four illegal western military interventions in the Global South: Afghanistan, Iraq, Libya, and Syria. Right-wing and neo-fascist parties in Europe are shamelessly creating xenophobia for racist political gain. The fear of foreigners is on the rise in Europe because European political leaders have failed to take ownership for their roles in creating the refugee crisis in the first place. As NATO member states, European powers have all loyally supported the US-led “War on Terror” which has translated into fifteen years of unending war against Muslims and Arabs in Asia and North Africa. If those leaders had accepted blame for the refugee crisis, some Europeans would not be taking out their anger on the refugees themselves, but rather on the leaders who created the crisis. The solution to the current refugee crisis is NOT to call for “open borders” and to turn current refugees into permanent residents of Canada and other accepting countries. Of course, refugees need to be protected and their human rights observed until the conflicts that caused them to leave their homes can be brought to an end. But most refugees wish desperately to return to their countries of origin. And war-torn countries, such as Syria, desperately need their externally-displaced citizens to return in order to reconstruct shattered economies. NATO countries need to pay reparations to reconstruct the countries they have illegally devastated and to fund the repatriation of the refugees. And they need to undertake not to wage illegal wars against sovereign countries in the future. Dissolving NATO would be a positive step in that direction.